Ir. (PII), ST. (UMY)., MSc.Eng (UKM), PG-Certf. (LARAM, Salerno), Ph.D. (UKM), P.Eng., IPM. Riyadi, Slamet; Sugiarto, Aris; Putra, Sri Atmaja; Setiawan, Noor Akhmad. Analysis of Digital Image Using Pyramidal Gaussian Method to Detect Pavement Crack. Advanced Science Letters, Volume 21, Number 11, November 2015, pp. 3565-3568(4). DOI: http://dx.doi.org/10.1166/asl.2015.6579. Sri Atmaja P. Rosyidi. Simultaneous in-situ stiffness and anomalies measurement on pavement subgrade using tomography surface waves technique. 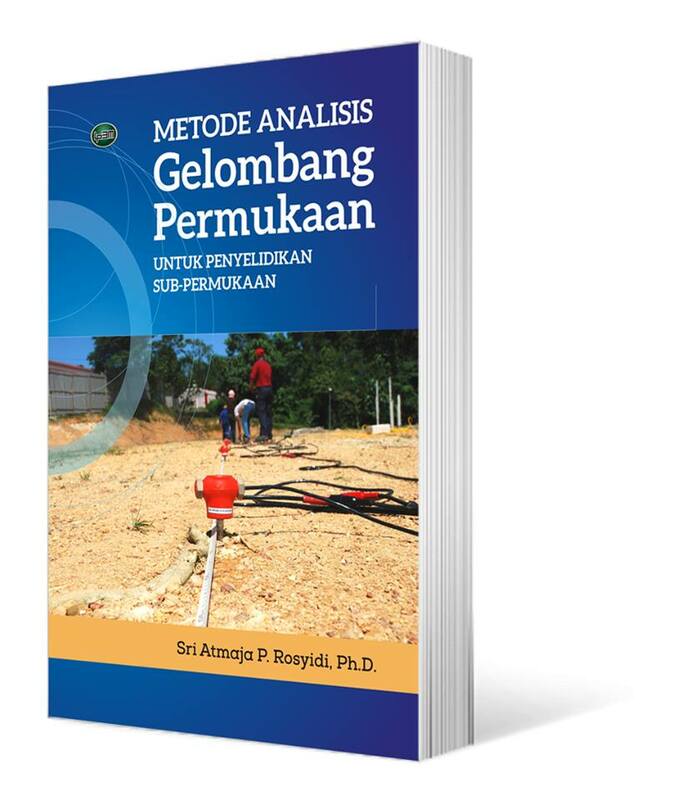 Procedia Engineering 125 ( 2015 ), Pages 534 – 540, DOI: 10.1016/j.proeng.2015.11.057. Yusoff, N.I.M., Hardwiyono, S., Ismail, N.N., Taha, M.R., Rosyidi, S.A.P., Nayan, K.A.M. Measurements of the elastic modulus of pavement subgrade layers using the SASW and fwd test methods. Baltic Journal of Road and Bridge Engineering. Volume 10, Issue 2, 2013, Pages 174-181, DOI: 10.3846/bjrbe.2015.22. S.A. Rosyidi, C.P.Abbiss, K.A.M. Nayan, M.R. Taha, Z. Chik & A. Ismail. Study of the relationship between stiffness parameters for base materials. Proceedings of the ICE – Transport, Volume 165, Issue 3, August 2012 pages 159 –165 , DOI: 10.1680/tran.10.00010. Sri Atmaja P. Rosyidi, Mohd. Raihan Taha. Coupled Procedure for Elastic Modulus and Damping Ratio Measurement on Pavement Subgrade Structures Using Surface Wave Method. 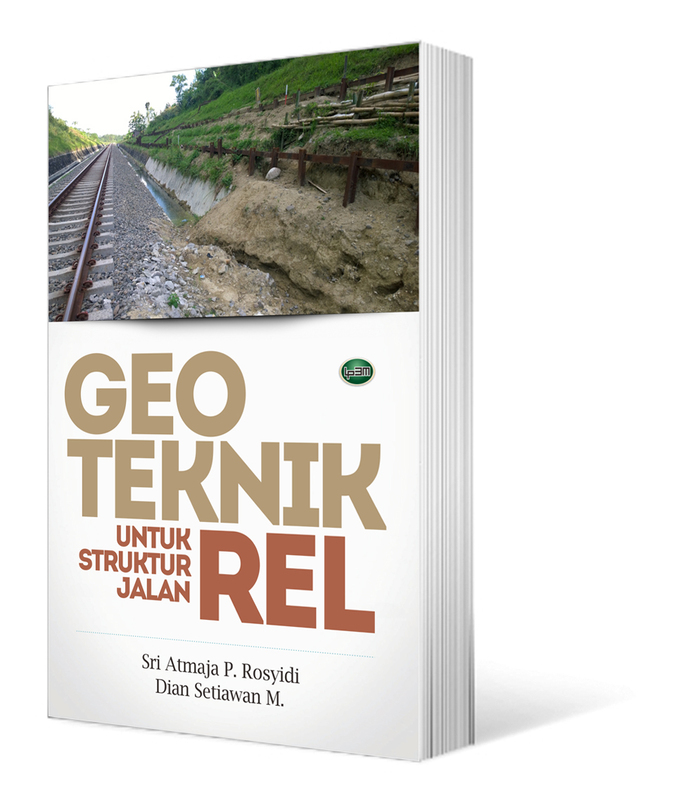 Contemporary Topics on Testing, Modeling, and Case Studies of Geomaterials, Pavements, and Tunnels (Geotechnical Special Publication 215, pp. 66-73, doi http://dx.doi.org/10.1061/47626(405)9). S.A. Rosyidi, T.A. Jamaluddin, L.C. Sian, M.R. Taha. Kesan Gempa 7.6 MW Padang Indonesia, 30 September 2009. Journal of Sains Malaysiana Vol. 40, No.12, December 2011, pp. 1393-1405 (SCOPUS/ISI IF 0.152). Z.Chik, T. Islam, S.A. Rosyidi, H. Sanusi, M.R. Taha, M.M. Mustafa. Comparing the Performance of Fourier Decomposition and Wavelet Decomposition for Seismic Signal Analysis. European Journal of Scientific Research, Vol.32 No.3 (2009), pp.314-328. S.A. Rosyidi, M.R. Taha, A. Ismail & Z. Chik, Signal reconstruction of surface waves on SASW measurement using gaussian derivative wavelet transform. Acta Geophysica, Vol. 57 No.3 (September 2009), pp.616-635, (Impact Factor 2009: 0.882, DOI: 10.2478/s11600-009-0015-8. S.A. Rosyidi, M.R. 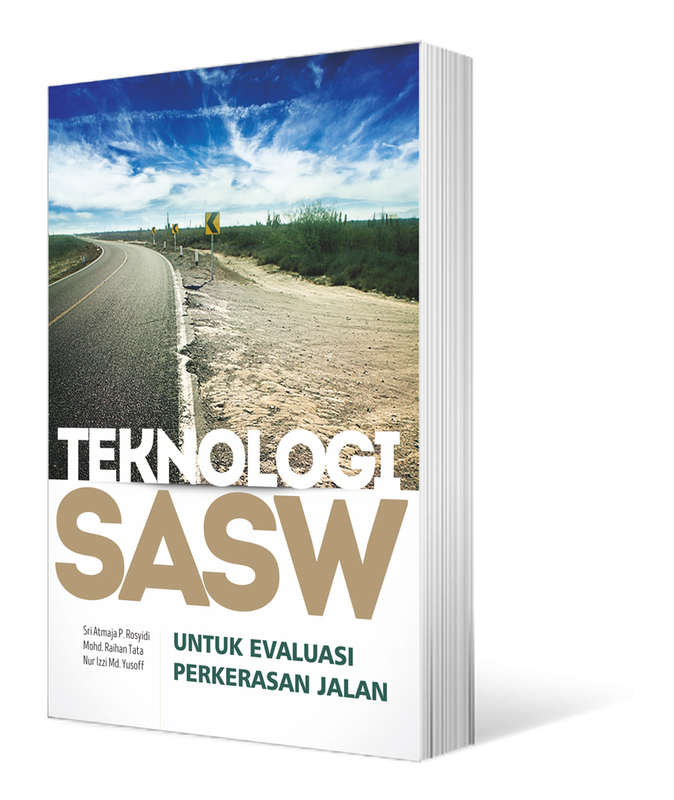 Taha, A. Ismail and Z. Chik, Evaluation of Pavement Subgrade Quality using the Spectral Analysis of Surface Wave Method, Journal of Sains Malaysiana, Vol. 38, No. 1 (February 2009), pp. 21-30 (ISSN: 0126-6039). Staf akademik di Program Studi Teknik Sipil, Jurusan Teknik Sipil, Fakultas Teknik Universitas Muhammadiyah Yogyakarta sejak April 2000, pada mata kuliah: perencanaan transportasi, prasarana transportasi, perancangan tebal perkerasan jalan, evaluasi dan teknologi perkerasan jalan, geo-kegempaan, manajemen bencana. 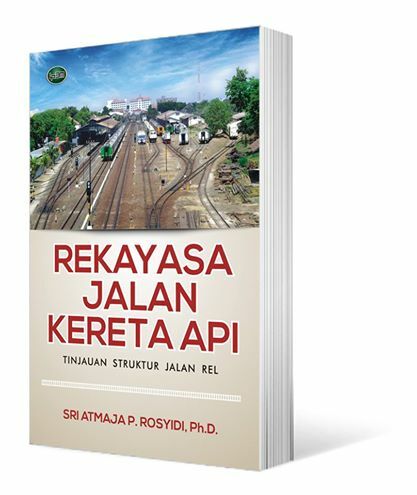 Principal Senior Research Fellow dalam bidang Energy Conservation in Built Environments, dan Energy in Transportation. Wakil Rektor Bidang Kemahasiswaan, Alumni, Promosi dan Kerjasama Universitas Muhammadiyah Yogyakarta pada periode 2011-2013, periode 2013 – 2017. Direktur, Center for regional Energy Management (Pusat Studi Pengelolaan Energi Regional/PUSPER) Universitas Muhammadiyah Yogyakarta periode 2010 – 2011, 2016 – sekarang. Direktur, Direktorat Pascasarjana Universitas Muhammadiyah Yogyakarta, 2017 – sekarang. Ph.D. (Doctor of Philosophy) dari Department of Civil and Structural Engineering, dari the National University of Malaysia (www.ukm.my) pada tahun 2008/2009. Pada tahun 2008, menyelesaikan program pascasarjana non-degree dari International School of Landslide Risk Analysis and Hazards Mitigation, University of Salerno, Italy (www.laram.it). Postdoctoral research fellow, GeoHazards and GeoEnvironment Research Group, the National University of Malaysia (www.ukm.my) pada tahun 2009 – 2011. Dosen, 2001, Jurusan Teknik Sipil, Universitas Muhammadiyah Yogyakarta. Assistant Professor, 2007, Jurusan Teknik Sipil, Universitas Muhammadiyah Yogyakarta. Postdoctoral Research Associate (Fellow) (2009-2011) pada Geohazards and GeoEnvironments Research Group and Geotechnical and GeoEnviromental Engineering Research Group (expertise: applied geophysics, soil dynamics and earthquake engineering) di the National University of Malaysia. Associate Professor, 2013, Jurusan Teknik Sipil, Universitas Muhammadiyah Yogyakarta. Review Daerah Rawan Bencana Jalur Kereta Api Pulau Jawa Bagian Utara (2017). Safety Assessment Assesor and Auditor (2017 – Sekarang). Overpass dengan Metode CMP pada Jalur Ganda Kereta Api Kutoarjo (2019). Review Desain Rumah Sakit PKU Wonosari (2018-2019). Telah dan sedang terlibat lebih dari 23 proyek penelitian yang didanai oleh UMY, Kementerian Pekerjaan Umum RI, Kementerian Pendidikan Tinggi RI, Kementerian Riset dan Teknologi Indonesia, Ministry of Science, Technology and Innovation Malaysia dan Ministry of Foreign Affairs, Netherlands (Agency of NL), European Commission and Embassy of the Royal of the Netherlands. telah menerbitkan lebih dari 30 makalah ilmiah pada Jurnal Internasional dan Nasional (Accrediated dan Non-Accredited); dan lebih dari 60 makalah ilmiah di Konferensi/Seminar Internasional dan Nasional. Medali Perunggu pada Malaysian Innovation and Research Expo and Competition 2004. Medali Perunggu pada Malaysian Technology Expo (2011), Ministry of Science, Technology and Innovation of Malaysia, 17-19 February 2011. 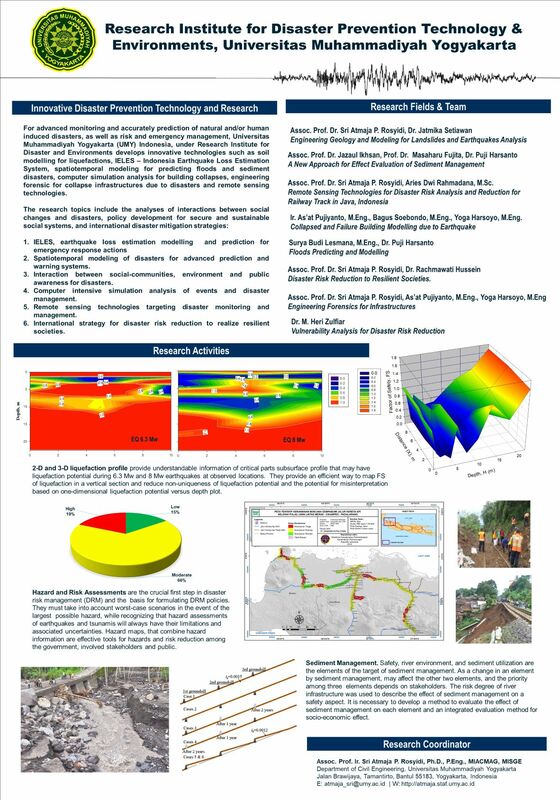 Medali Emas & The Best Award (Invention & Innovation Awards 2013), pada Malaysian Technology Expo (2013), Geo-Sw@T: An Innovative Landslide Prediction Using Seismic Signal Analysis, Ministry of Science, Technology and Innovation of Malaysia, 21 – 23 February 2013. 2 trademarks: GEO-SW@T (TM), No. 09008357, Class 42; No. 09008358, Class 9. Academic (Faculty) staff at Civil Engineering Programme, Department of Civil Engineering, Faculty of Engineering, Universitas Muhammadiyah Yogyakarta since April 2000, in subjects of Transport Planning and Modeling, Transportation Infrastructures, Pavement Design, Pavement Evaluation Technology and Management System, Geo-Earthquake Engineering, Disaster Management. Principal Senior Research Fellow in the field of Energy Conservation in Built Environments, and Energy in Transportation, Center for regional Energy Management (Pusat Studi Pengelolaan Energi Regional/PUSPER). Vice Rector for Student Affairs, Alumni, Promotion and Partnerships, Universitas Muhammadiyah Yogyakarta 2011 – 2013, 2013 – 2017. Director of Center for regional Energy Management (Pusat Studi Pengelolaan Energi Regional/PUSPER) Universitas Muhammadiyah Yogyakarta 2010 – 2011, 2016 – now. Director, Directorate of Postgraduate Studies, Universitas Muhammadiyah Yogyakarta, 2017 – current. 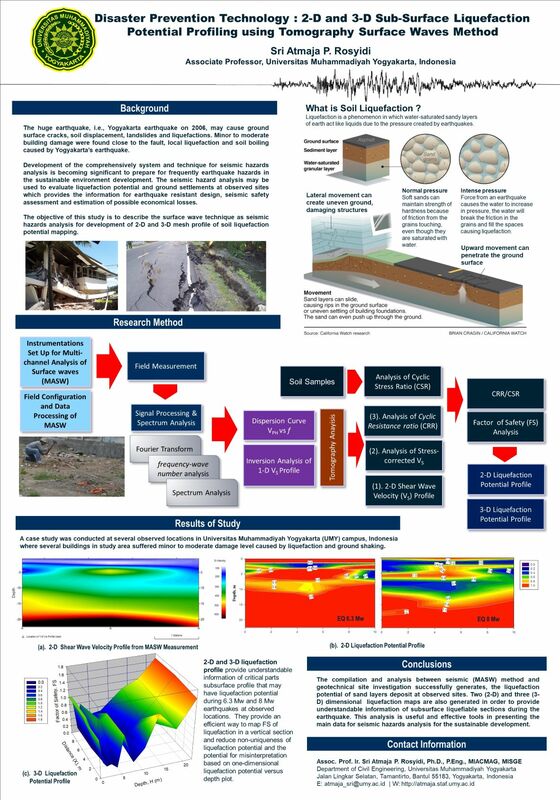 Non-degree Postgraduate Program from International School of Landslide Risk Analysis and Hazards Mitigation, University of Salerno, Italy (www.laram.it), 2008. Ph.D. (Doctor of Philosophy) degree from Department of Civil and Structural Engineering, National University of Malaysia, also known as Universiti Kebangsaan Malaysia (www.ukm.my) in 2003/2004 and 2008/2009, respectively. Lecturer, 2001, Department of Civil Engineering, Universitas Muhammadiyah Yogyakarta. Assistant Professor, 2007, Department of Civil Engineering, Universitas Muhammadiyah Yogyakarta. Postdoctoral Research Associate (Fellow) (2009-2011) in Geohazards and GeoEnvironments Research Group and Geotechnical and geoenvironmental Engineering Research Group (expertise: applied geophysics, soil dynamics and earthquake engineering) at the National University of Malaysia. Associate Professor, 2012, Department of Civil Engineering, Universitas Muhammadiyah Yogyakarta. He has involved in more than 25 research projects funded by UMY, Ministry of Public Works Indonesia, Ministry of National Education Indonesia, Ministry of Research and Technology Indonesia, Ministry of Science, Technology and Innovation Malaysia dan Ministry of Foreign Affairs, Netherlands (Agency of NL), European Commission and Embassy of the Royal of the Netherlands. More than 30 papers have been published in the reputable international journals and the accredited national and local journals. He also presented more than 60 technical papers in the prestigious international and national conferences/seminars. Bronze Medal in Malaysian Innovation and Research Expo and Competition 2004. Bronze Medal in Malaysian Technology Expo (2011), Ministry of Science, Technology and Innovation of Malaysia, 17-19 February 2011.